Randall Raines, a.k.a. 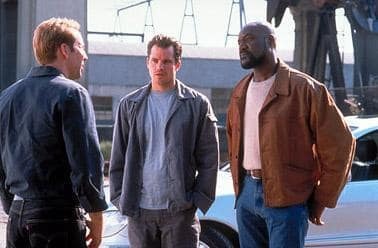 Memphis Raines, is back in the business of stealing cars for one night in order to save his brother. The cops, though, are onto him from the start. Tumbler: Yo, so check out my new move. I call it "the Stranger." What I do is, I sit on my hand for, like, 15, 20 minutes, until it goes numb. No feeling at all. And then I rub one out. Atley Jackson: It's like a little boy's nursery school I've come upon here. Memphis: Without disappointment you cannot appreciate victory. Det. Roland Castlebeck: Did Eleanor tell you that?